50.00 mm Breitlight case made from a lightweight high-tech polymer that’s been charged with composite fibers for strength and rigidity, screw-locked crown, unidirectional ratcheted bezel, cambered sapphire crystal with glareproof treatment on both sides, Volcano black dial with with Arabic 12 hour indicators, selfwinding high frequency Breitling B12 movement with date display, chronograph function, 70 hours of power reserve, anthracite black military rubber strap with folding buckle. Water resistant to 100 m (330 ft). 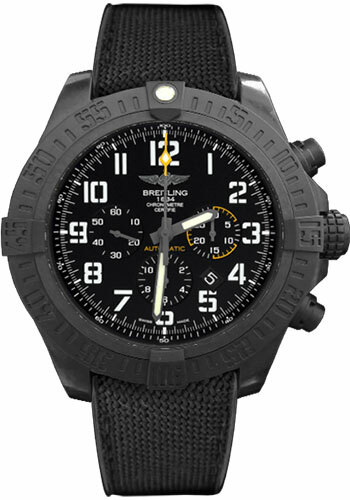 50.00 mm Breitlight case made from a lightweight high-tech polymer that’s been charged with composite fibers for strength and rigidity, screw-locked crown, unidirectional ratcheted bezel, cambered sapphire crystal with glareproof treatment on both sides, Volcano black dial with with Arabic 12 hour indicators, selfwinding high frequency Breitling B12 movement with date display, chronograph function, 70 hours of power reserve, anthracite yellow military rubber strap with folding buckle. Water resistant to 100 m (330 ft). 50.00 mm Breitlight case made from a lightweight high-tech polymer that’s been charged with composite fibers for strength and rigidity, screw-locked crown, unidirectional ratcheted bezel, cambered sapphire crystal with glareproof treatment on both sides, Cobra yellow dial with with Arabic 12 hour indicators, selfwinding high frequency Breitling B12 movement with date display, chronograph function, 70 hours of power reserve, anthracite black military rubber strap with folding buckle. Water resistant to 100 m (330 ft). 50.00 mm Breitlight case made from a lightweight high-tech polymer that’s been charged with composite fibers for strength and rigidity, screw-locked crown, unidirectional ratcheted bezel, cambered sapphire crystal with glareproof treatment on both sides, Cobra yellow dial with with Arabic 12 hour indicators, selfwinding high frequency Breitling B12 movement with date display, chronograph function, 70 hours of power reserve, anthracite yellow military rubber strap with folding buckle. Water resistant to 100 m (330 ft). 50.00 mm Breitlight case made from a lightweight high-tech polymer that’s been charged with composite fibers for strength and rigidity, screw-locked crown, unidirectional ratcheted bezel, cambered sapphire crystal with glareproof treatment on both sides, Volcano black dial, selfwinding high frequency Breitling B12 movement with date display, chronograph function, 70 hours of power reserve, anthracite yellow military rubber strap with folding buckle. Water resistant to 100 m (330 ft).